PAOLO ZUBILLAGA (4) of Pacifica is defended by Jared Brown of Cypress. The Centurions won 68-53 in a showdown for the Empire League lead (Orange County Tribune photo). Speed kills, as the saying goes. The hardwood velocity of the Cypress High Centurion boys’ basketball team scorched Pacifica’s Mariners 68-53 Tuesday night in a showdown for the Empire League lead. The host Centurions blazed out to a 43-21 halftime edge and held off a late PHS charge to move into undisputed possession of first place at 5-0 (17-4 overall) while the M’s fell to 4-1 and 14-7. PACIFICA and Cypress players wrestle for a loose ball in Empire League play Tuesday night (Orange County Tribune photo). “I don’t think we were prepared for their speed,” said Pacifica coach David Friedman. “It’s something you can’t simulate in practice.” A 24-8 second quarter differential almost put the game out of reach, but the Mariners fought their way back into the contest, cutting the Centurion lead to seven at one point in the third period before falling back on chilly shooting. “I think we missed six out of seven shots at the end,” said Friedman. Paolo Zubillaga led Pacifica with 15 points. Andrew Brown added 12 and Tyler Fabisiak had 11. 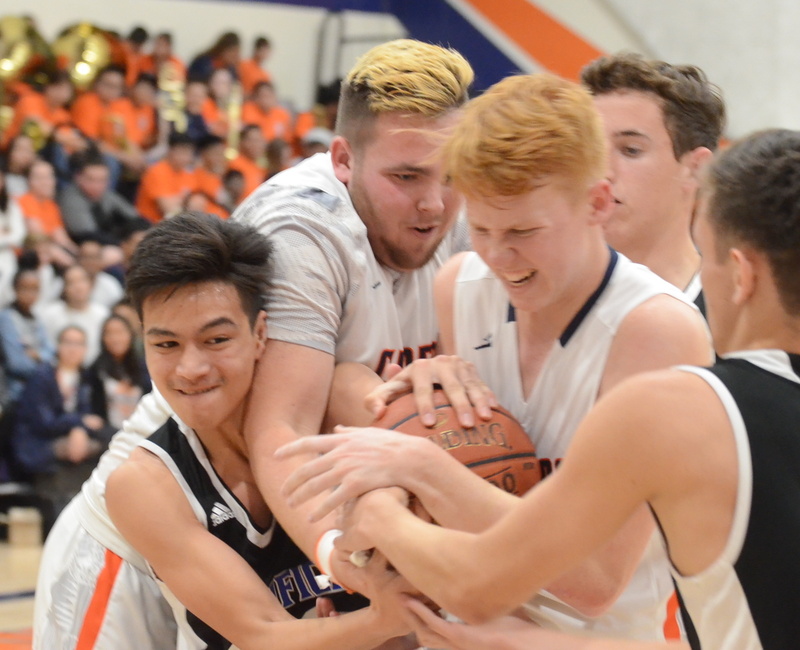 For Cypress, the top scorer was Erik Papke with 16 points. Jared Brown had 15 and Anthony Tello 11. 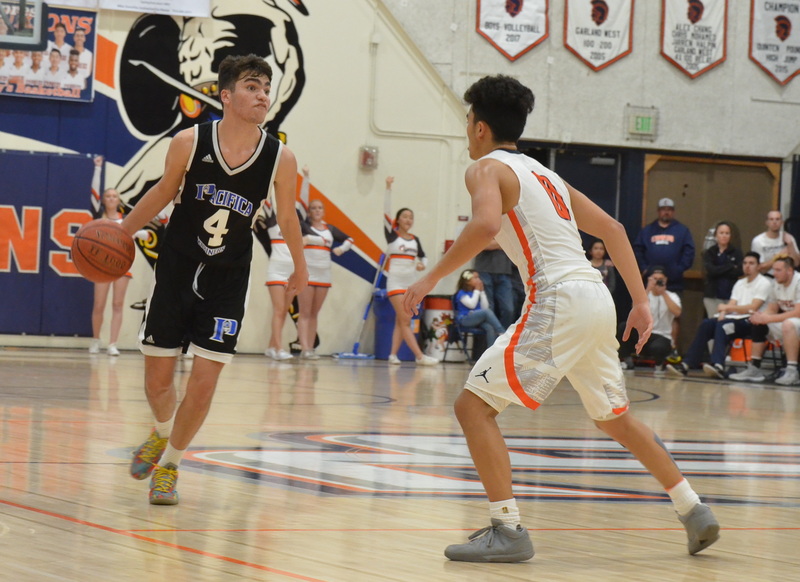 Although Cypress won this one, Pacifica will have another shot at the Centurions on Feb. 8 when the team hosts the Centurions at the Mariner gymnasium. With a better understanding of just how quick-footed their opponents are, the M’s are hoping for a different outcome. Sebastian Castro scored 33 points to lead Garden Grove High to 72-65 win over Bolsa Grande Tuesday night for the Argonauts’ 16th consecutive win. The victory improved Grove’s overall record to 21-1 and 5-0 in Garden Grove League play. Bolsa fell to 12-10 and 2-3. Top scorers for the Matadors were Brandon Lai and Andrew Pham, each with 17 points.